The Franklin tree, seen here in its autumn colors, is extinct in the wild. 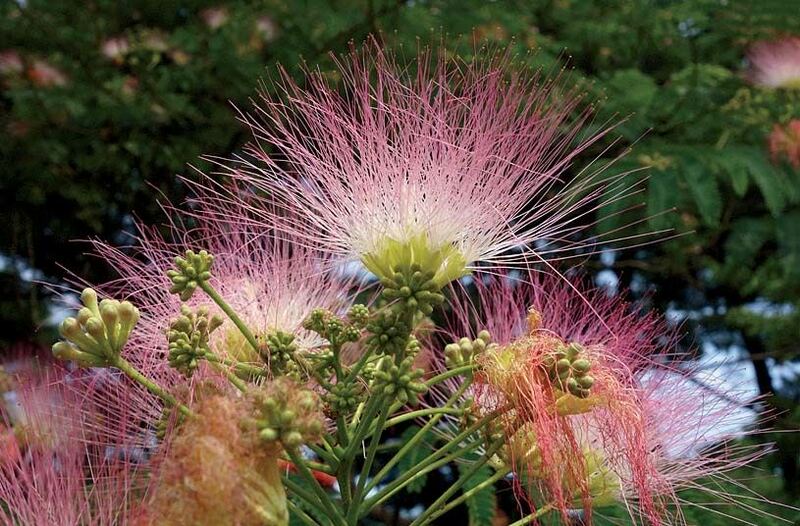 The silk tree, an Asian native prized for its fragrant and showy blooms, was introduced to North America in 1745. Relict wild populations of the Torrey pine grow only in Southern California, at the southernmost reach of the last glaciation, but the plant retains genes that make it hardy at the arboretum. 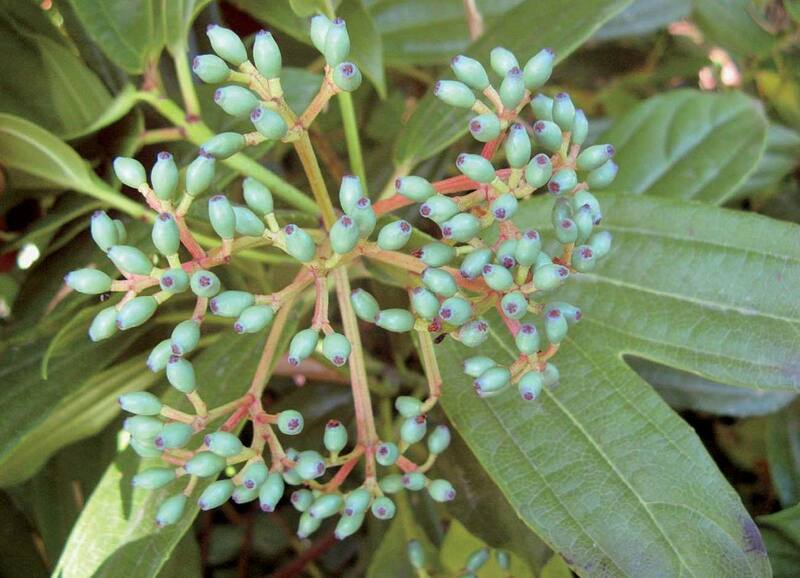 Acquiring Viburnum davidii, an evergreen representative of the genus, would add a completely new evolutionary lineage to the arboretum’s living collections. Many mornings, before classes, Michael Donoghue would roll out of bed in the “rickety old house” he shared with several other graduate students, and consider how lucky he was. He lived rent-free on 281 acres, formerly an estate and contiguous farmlands, in Boston’s Jamaica Plain neighborhood. Periodically, when a windstorm felled a tree on the grounds, workmen would deliver wood for the fireplaces. But that’s not why Donoghue, then working toward his 1982 Harvard doctorate, considered himself fortunate. For him, the draw of this enviable situation was the plants: trees and shrubs gathered from around the world, some rare or endangered, that grew just outside his door, where he could study them at length and compare them side by side as they changed through the seasons and from year to year. This global collection of botanical diversity at Harvard’s Arnold Arboretum  is rooted in a tradition of botanist-explorers, stretching back at least to the eighteenth century, when the preeminent plant-hunters in colonial North America were funded by monarchs seeking ornamental specimens for their gardens and estates, or trees that would yield timber or fruit for the economic good of the nations they ruled. 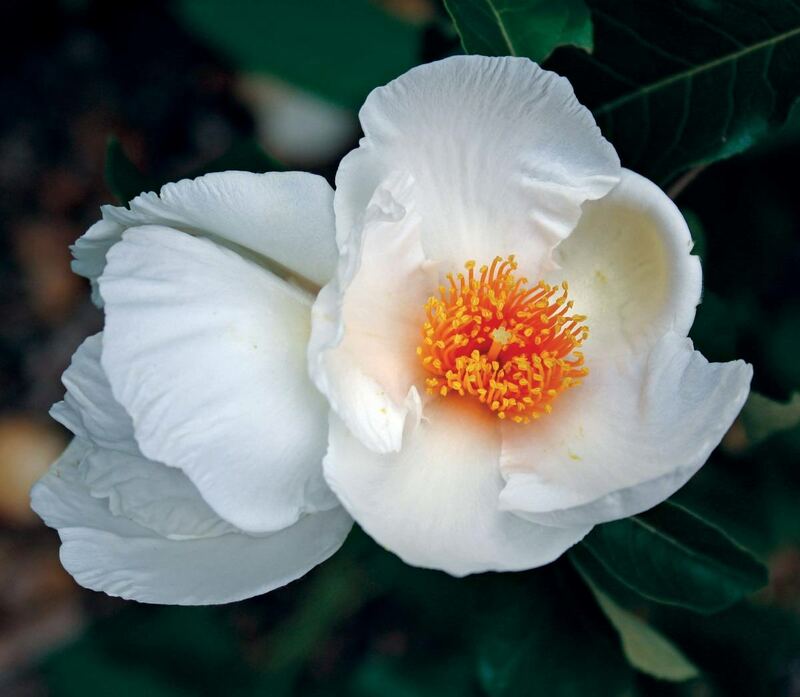 In October 1765, for example, John Bartram, royal botanist to George III, and his son William discovered an unknown plant with beautiful fruit growing along the banks of the Altamaha river in Georgia; they named it Franklinia alatamaha after fellow Pennsylvanian Benjamin Franklin. The Franklin tree, one of their most notable horticultural finds, is now considered extinct in the wild, but still grows in the gardens of connoisseurs—and at the decidedly democratic Arboretum, which has a particularly massive and long-lived specimen. Other botanists introduced foreign plants. André Michaux, who served Louis XVI of France and discovered Rhododendron catawbiense crowning peaks in the Blue Ridge mountains with its purple flowers, also introduced the silk tree and camellia to North American gardens. Specimens of all these plants grow at the arboretum today. But the explorer who left the greatest legacy of botanical diversity to the arboretum was its own Ernest Henry Wilson, whose decades of exploration in East Asia in the early 1900s brought more than 2,000 new plants to the West, including Acer griseum, the paperbark maple, known for its beautiful exfoliating bark. Wilson called the arboretum, which he ran from 1927 until his death in 1930, “America’s Greatest Garden,” and it has continued its plant explorations ever since. Now, though, the arboretum is launching a new era of discovery, focused on collecting exceptional representatives of botanical variation from a rapidly changing world. A plan unveiled this spring  aims to secure the collections’ scientific importance for the next century. The agenda is spurred by widespread destruction of native plant habitats due to global development, as well as threats to the diversity of plant populations caused by rapid changes in prevailing climatic conditions. It calls for 10 years of expeditions to global sites—principally in the Northern Hemisphere—to sample as much of the remaining diversity as possible among woody plants that will grow in Boston’s temperate, but warming, climate. This time, the collecting targets are driven principally by scientific criteria, including new understanding of plant phylogenies (family trees showing the evolutionary history of relationships among plants), conservation considerations, and attention to developing biological breadth among the arboretum’s existing living specimens. Arboretum director William (Ned) Friedman and graduate student Kristel Schoonderwoerd recently discovered that seed development in Franklinia continues for a full year after pollination, with a seven-month pause in winter—exceedingly rare among flowering plants. For example, Friedman, an evolutionary biologist, studies the diversification of seed plants, and has made extensive use of the arboretum since his arrival at Harvard in 2011. Pollination biology in rhododendrons and conifers, bud formation and climate change in hickories and walnuts, and the role of mutation in new floral forms of redbuds have all drawn him and his lab team into the living collections. Most recently, he has been studying the arboretum’s Franklinia specimens, which grow in the Explorer’s Garden atop Bussey Hill, where the most sensitive plants are sited. He and graduate student Kristel Schoonderwoerd have discovered that the plant’s extraordinary cultural history is matched by its most unusual reproductive biology: a seven-month winter dormancy that intervenes between the time a flower is pollinated in late summer and the moment the first fruits begin to develop the following season—akin to waiting two seasons for an apple to ripen. Friedman speculates that the Franklin tree’s unusual pattern of hitting pause after pollination may have evolved as the plant’s ancestors, which likely originated in the subtropics, migrated north and adapted to colder conditions. 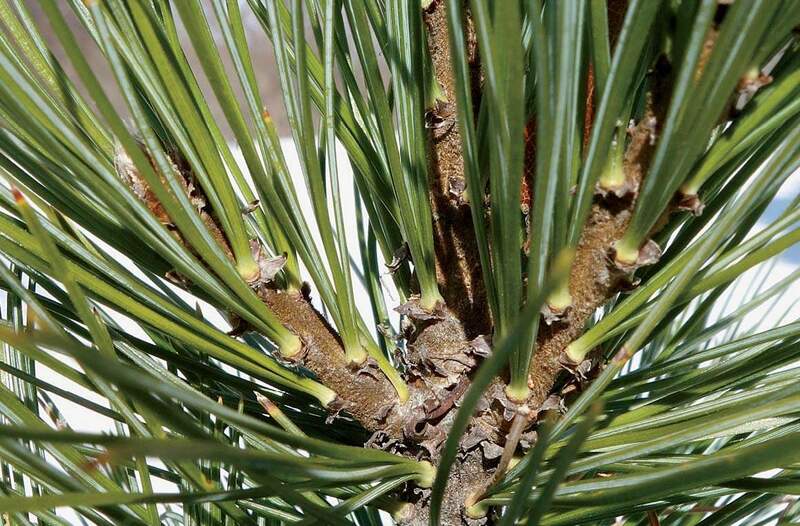 The Arnold Arboretum plans to collect plants from around the globe at the sites indicated. 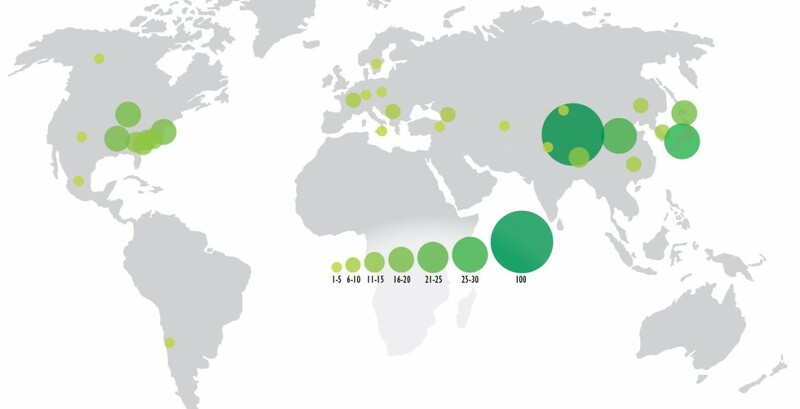 China, with temperate zones not unlike Boston's, will be the single most important source of acquisitions from the wild. Plants from the Southern Hemisphere, on the other hand, often can’t survive New England's seasonal climatic fluctuations. Consistent with E.H. Wilson’s focus on China and environs, a region he called “the mother of gardens” because of the extraordinary biodiversity he had found there, by far the largest number of newly anticipated acquisitions is expected to come from eastern Asia; the plants Wilson collected there adapted well to Boston’s similar latitude. Now, of course, both regions are subject to climate change, and China is also an epicenter for development, habitat destruction, and impending species loss. The arboretum’s approach is exceptional, he continued, for using “knowledge of the evolutionary tree of the flowering plants and the conifers to think about how best to sample in order to represent diversity.” Taking this new approach will make the collection even more valuable to researchers. Hufford himself worked on the first family tree of hydrangeas in the 1990s, using plants at the arboretum and at Kew to figure out the relationships among living species of that genus. Without those resources, he says, the project would have required years of work tracking down wild populations in China. Curator of living collections Michael Dosmann with Acer griseum, the paperbark maple. Another reason for acquiring more plants of wild origin has to do with provenance. The arboretum maintains extraordinarily detailed records about its 15,000 accessioned plants: where in the world they can be found, where and when they were originally collected, and their current health. There are even data about the 75,000 plants that have died or have been removed since the arboretum was founded in 1872, all georeferenced on map layers. This kind of documentation, much of it available online, makes the collection all the more valuable to researchers, and even to casual visitors. But because many of the species now in the living collections are either cultivars (selections of especially robust and attractive plants that circulate in the nursery trade) or plants whose provenance is unknown, obtaining wild representatives, preferably from multiple places within their natural range, is a priority. The importance of sampling broadly from across a plant’s natural range, in order to sample diversity within a species, was demonstrated early in the arboretum’s history, when its first director, Charles Sargent, wanted to grow Cedrus libani, the biblical Cedar of Lebanon, a tree native to the Mediterranean. These trees may be seen all over Europe; they were carried back as mementos of the Crusades. But in Boston, none proved hardy enough to survive the winter. Sargent therefore acquired seed from trees growing high in the Taurus Mountains of Turkey, where the elevation ensured freezing temperatures. That population proved completely hardy at the arboretum, and even further north. A significant number of the plants targeted for collection during the future expeditions are considered marginally hardy in Boston today. But winters are becoming milder, and remote temperature monitoring throughout the grounds has produced more granular understanding of the arboretum’s own microclimates, helping its horticulturists site plants with ever better precision. The push for biological breadth has led to ambitious attempts, for example, to grow flowering plants with evergreen leaves. In 2012, Michael Dosmann and a colleague from the Morris Arboretum of the University of Pennsylvania collected acorns and cuttings from the northernmost U.S. stand of live oaks (Quercus virginiana, the southern, evergreen species seen dripping with Spanish moss in movies), located on the Virginia coast, in the hope that they might get a plant to survive. “We’ll have to get creative if we want to add some of this material to the collections,” Dosmann admitted. “We are going to lose some of the live oaks, maybe all of them—but why not grow” them as part of the arboretum’s bonsai collection, which horticulturists move into greenhouses during the cold season, so “a researcher could still grab the DNA from a leaf?” This is an innovative way to expand the scope of the collection into less hardy genera. With live oak now mostly in hand, the arboretum’s wish list includes similarly ambitious quarry among other groups of plants, including an evergreen shrub, Viburnum davidii, a subtropical species native to China. 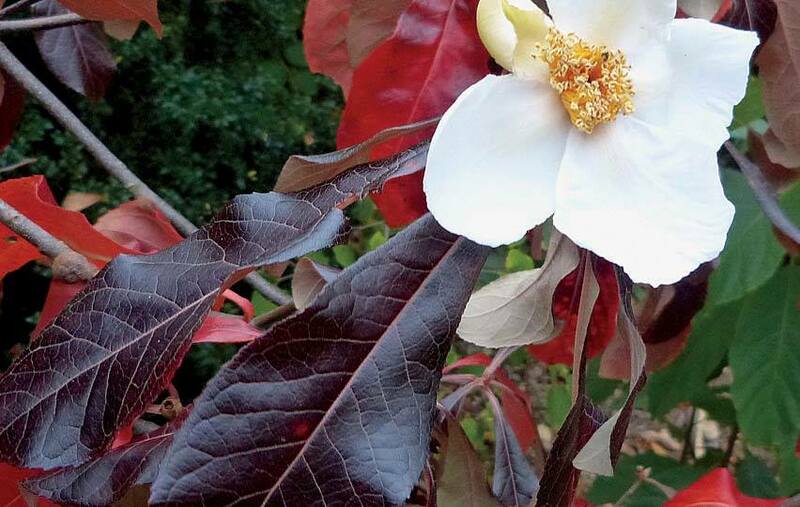 A phylogeny, or family tree, shows the evolutionary history of Stewartia, and its ancient relationship to Franklinia. This phylogeny (from Li et al., 2002) was constructed using molecular data from the arboretum's living collections, and was used to study the geographical distribution of New World and Old World groups of Stewartia. At right, the characteristic mottled bark of Stewartia pseudocamellia. “We can’t know exactly what will be important 50 years from now,” Dosmann noted. “Nobody could have predicted that plant phenology [the study of events such as flowering time or leaf-out in response to seasonal phenomena including temperature, length of day, drought, and so on] would become useful in the study of climate change.” Phenological work at the arboretum from the 1970s to the present, for example, helped Donoghue and his co-workers recognize that two factors—the branching architecture of the plant, and the type of buds that a plant has—are the best predictors of how well any species will respond to fluctuations in climate. Now phenology is a principal focus for researchers like the arboretum’s Elizabeth Wolkovich, assistant professor of organismic and evolutionary biology, who has recruited a team of citizen scientists to record such events on the grounds. She wants to understand how differences in the way plants react to cues such as warming, chilling, and photoperiod affect their competition for resources and the formation of plant communities. Climate change will alter the composition of temperate forests, she says, and her research aims to predict the effects of such change. What happens if important mast-producing species such as oak and beech, for example, reach the limits of their ability to respond to changes in seasons, fail to set seed, and decline? Nobody knew in 1910, when E. H. Wilson first collected a single Tsuga chinensis, the Chinese hemlock, that by the end of the twentieth century its American cousin Tsuga canadensis would be decimated by an insect infestation (see “A Hemlock Farewell ,” July-August 2014, page 8) to which the Chinese plant is resistant, as horticulturists at the Morris Arboretum observed in the 1980s. The single plant Wilson collected had been the parent of all Chinese hemlocks in the United States until 1979. A number of new collections have been made since the mid 1990s, but the arboretum wants more specimens from China in order to increase diversity of the species in the United States. The institution’s goal is to be a repository of both plant material and knowledge, a resource at the ready for an uncertain future. To that end, the arboretum has also targeted for acquisition many woody plants—clones from the exact, individual specimens—that have already had their genomes sequenced. Such plants, which might be languishing in a research greenhouse somewhere or growing near a lab—and could easily perish from neglect—are scientifically valuable because they are the source of rich, painstakingly annotated genetic data. For the same reason, the arboretum will simultaneously encourage researchers the world over to use individual plants from its living collection for whole-genome sequencing. This project, supported by special funding, will create a kind of genetic library that can be used for reference purposes in the future. Having genetic sequences to complement seeds, cuttings, and living plants will provide another resource for scholars. With efforts on this scale, Friedman knows that arboretum expeditions will bring home more species than the 395 that are on its list. Expeditions last year returned with 73 kinds of plants, of which only 24 were actually targeted—a powerful reminder of the diversity that exists in the wild just waiting to be studied. Friedman is thrilled by what the explorers were able to obtain: “There’s a genus of plant that we never had here that Michael Dosmann collected in China with our wonderful Chinese colleagues and partners at the Chengdu Chinese Academy of Sciences Institute of Botany. We never would have dreamed that we could acquire this material from the wild.” And he expects more of the same—including the discovery of species previously unknown to science. Even so, the price of such knowledge seems, if anything, low compared to the return. The 350,000 species of flowering plants (the angiosperms), which include every fruit, vegetable, and grain, emerged in an explosion of evolution about 135 million years ago. They form the basis of the food chain on the planet, yet the question of why they have been so much more successful than the other seed plants that preceded them—of which there are under 2,000 extant species, mostly conifers and cycads—remains unanswered. If flowering plants are the bulwark of life, wouldn’t it be crucial to know what climatic conditions or inherently evolved traits fueled their diversification and success—and the limits of their adaptability?